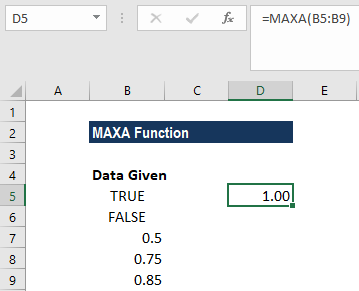 What is the MAXA Function? 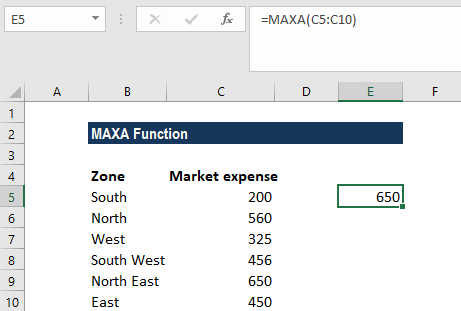 The MAXA Function is categorized under Statistical functionsFunctionsList of the most important Excel functions for financial analysts. This cheat sheet covers 100s of functions that are critical to know as an Excel analyst. MAXA will return the largest value in a given list of arguments. From a given set of numeric values, it will return the largest value. The function compares numbers, text, and logical values as TRUE or FALSE. In financial modelingWhat is Financial ModelingFinancial modeling is performed in Excel to forecast a company's financial performance. Overview of what is financial modeling, how & why to build a model. A 3 statement model links income statement, balance sheet, and cash flow statement. More advanced types of financial models are built for valuation, plannnig, and, the MAXA function can be useful in extracting the maximum numeric value, ignoring empty cells. For example, we can calculate the highest test score, or the fastest runner time in a race, the lowest temperature, or the smallest expense or sales amount, etc. 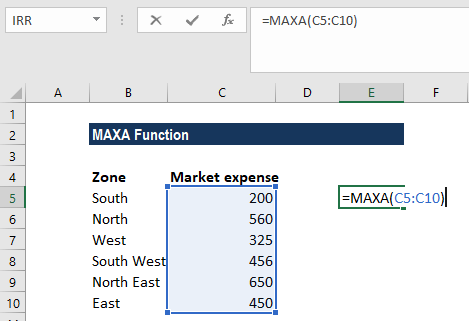 Value1 and value2 are the arguments used for the MAXA function, where Value1 is required and the subsequent values are optional. In MS Excel 2007 and later versions, we can provide up to 255 number arguments to the function. However, in Excel 2003 and earlier versions, it can only accept up to 30 number arguments. Arguments can be provided as constants, or as cell references or ranges. 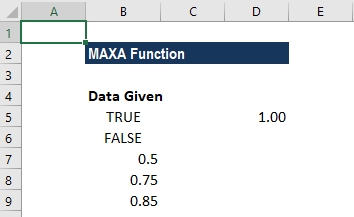 Also, the MAXA function evaluates TRUE and FALSE values as 1 and 0, respectively. 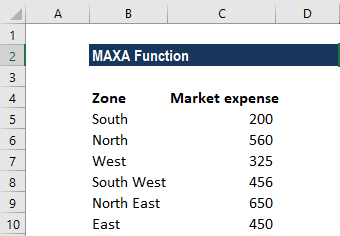 How to use the MAXA Function in Excel? We get 650 as the result, which the largest expense in the given range. Using the function, we can retrieve the largest value from the set of values in cells A2-A6. We get 1 as the result. The MAXA function treated the value TRUE in cell A2 as the numeric value 1. Therefore, it is the highest value in the range A1-A6. #VALUE! 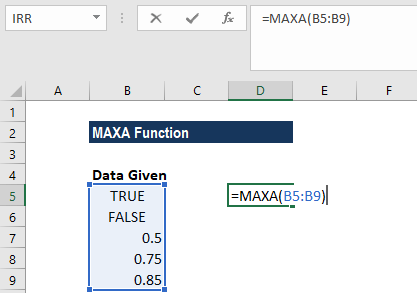 error – Occurs if any values that are supplied directly to the MAXA function are non-numeric. The MAXA function evaluates TRUE and FALSE values as 1 and 0, respectively. The primary difference between MAX and MAXA is that the “A” version evaluates TRUE and FALSE values as 1 and 0, respectively.